Strip away the political finger-pointing over President Barack Obama’s proposed budget and the fight boils down to a clash of values. Both major parties are really for big government — just big in different places. Republicans say they’re outraged that Obama would “borrow and spend” his way to a new behemoth government. But they borrowed and spent their way through the 1980s and the current decade. And they love big government — when it’s at the Pentagon. Democrats from Obama on down insist that they don’t like big government, that they’re just forced into a temporary spending spree by the recession. But Democrats love big government as well, when it’s for social programs such as universal health care. He presents this comparison of spending by Democrats and Republicans (click on image for larger view). Of the three presidents compared it looks like the Republicans might better be called the party of big government. 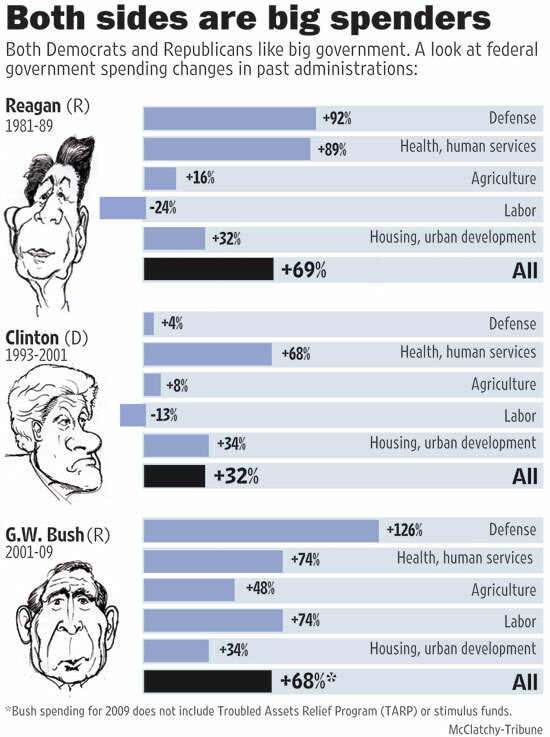 Even government spending in areas such as health and human services and agriculture increased more under the Republicans. Of course this whole debate over the size of government misses the point. The real issue is how much the government intrudes in the lives of individuals. This is where the Republicans are really the party of big government. Posted in Democrats, Economy, Foreign Policy & National Security, George Bush, Health Care, Republicans. Tags: Big Government, Democrats, Health Care, Republicans. RSS feed for comments on this post.. TrackBack URL. Massively depressing. None of them can resist (Yet being a non-liberal, I will choose to point out that nobody can dispute Reagan’s administration helped bring about the dissolution of communism which required massive defense spending and I’m not certain either side voted against defense/national security spending after 9/11 which I think was part of the deficit that Obama “inherited”. That and, oh, a couple of hurricane bailouts). The current administration has every opportunity to correct this mess yet spends more than every other president that has ever held office combined (Libs will, of course, point out this is their crisis to spend on…so on and on spending money we don’t have goes). It reeks that liberals justify this current atrocity by pointing fingers saying, “well they did it too. We inherited this mess” Wah. Who cares. Spend away folks. 25% of Americans do not even know where the government gets its money. FoxNews poll (which for all I know is discredited here) said that these 25% think the government has “plenty of its own money without using taxpayer dollars.” Rock on. I’m sorry. I meant to say that Reagan’s administration helped bring about the end of the Cold War. Obviously communism is alive and well. Do you have a link to that poll? The wording might make a difference. You would hope that people would realize the government money comes from taxpayer dollars, but polls often do reveal an astounding amount of ignorance. I choose to dispute the claim that ‘nobody can dispute Reagan’s administration helped bring about the end of the Cold War.’ Of course it can be disputed. It simply is not so. Outside of Jack Ryan novels, there is no legitimacy to the claim that Reagan defeated Communism. Ronald Reagan took office in a detente environment in which SALT, the first diplomatic agreements with China, and economic dealings with the USSR already had the Cold War winding down. It was ending thanks to the diligent work of Richard M. Nixon and natural forces, and as it threatened to become the Cold Peace, Reagan escalated it wildly for political purposes. Ronald Reagan’s defeat of the USSR is a Republican myth and a fictional element of Tom Clancy’s novels. Personally, I could care less about a ‘bigger’ or ‘smaller’ government. Ron is right in nailing the real point: the intrusion of the government into the lives and privacy of law abiding citizens. I would also add its support for expanded intrusion into same by corporate influence as well. The real issue is not more or less spending or higher or lower taxes; the real issue is intelligent, rational tax policy and judicious consideration of the necessity, benefits, and consequences of government action. There are areas where the government throws good money after bad in defense, education, and health care most notably. However, in these cases the solution is not to spend less money but to spend money more rationally. Of course, I’m one of those liberals Ron talks about wanting to see money spent in specific areas. Yet I have my conservative impulses too. There is plenty of government spending that can and should be cut, but there are also plenty of necessary programs that will cost money. I’m willing to give Reagan some credit for winning the cold war–but only when also giving similar credit to those who came before him. Reagan does deserve credit for one thing. Despite all the conservative rhetoric about the evil empire, he was smart enough to talk to them when someone like Gorbachev came along. Today’s conservatives (and PUMAs) would probably oppose such talks. Eclectic Radical: There is no such thing as a “intelligent, rational tax policy”. I’m willing to give Reagan his proper degree of credit for the process, and I agree entirely with your second paragraph. Yes. What I dispute is the notion that Reagan’s irresponsible escalation was a positive development or responsible for ‘victory.’ Reagan, himself, abandoned it as failed and engaged Gorbachev. The massive resumption of ‘hostilities’ in the early eighties undid progress done by Reagan’s predecessors (most notably Nixon) and was largely counterproductive. When he returned to the pattern that had proven successful, with Nixon, he was able to contribute. I should note that Chernenko and Andropov pursued many of the same policies that Gorbachev would later make official as ‘glasnost’ and ‘perestroika’, and that Reagan specifically rebuffed them in the same manner today’s conservatives oppose talks with dangerous nations today. The big difference is he learned from his mistakes. John Scott Dot Net, what you just said is one of those ‘faith based conservative/libertarian positions’ people keep talking about. It’s a right wing talking point. It means little but right wingers think they are saying something which is both meaningful and witty when they repeat such lines. Philosophically I’d love it if we could provide all functions which the private sector is not able to handle without resorting to taxation. Unfortunately that is not the case. There will be reasons to question and criticize any tax plan but they do work–they do bring in money.